The Costa Mesa City Council has made the first round of cuts in the quest to re-populate the three commissions they vacated recently. 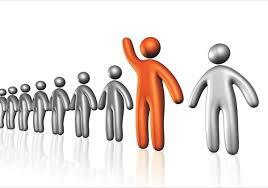 Sixty-eight (68) individuals applied for one or more positions on the commissions. 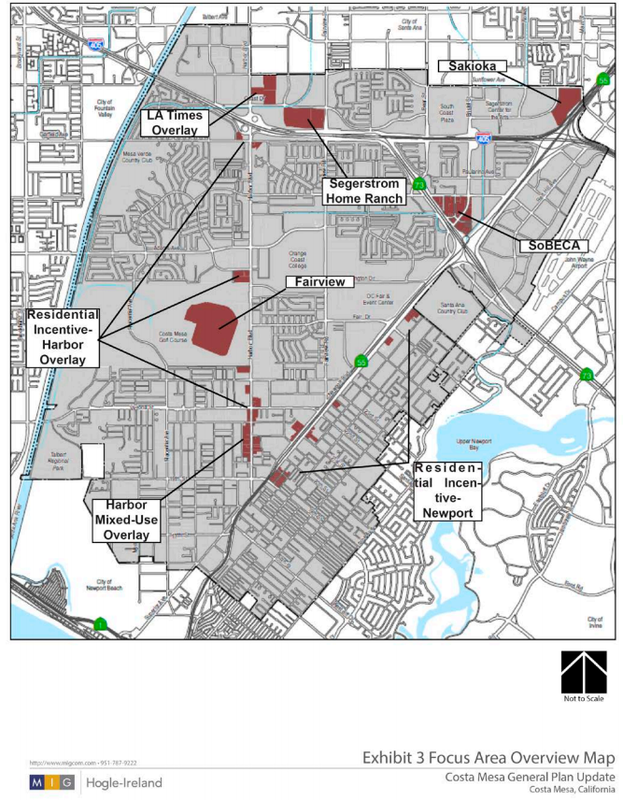 Those applications were reviewed by the council members who winnowed them down to thirty-four (34) who will be invited for interviews at the special meeting on Tuesday, January 24, 2017 beginning at 4:15 p.m. in Conference Room 1A at City Hall. You may recall that each council member was to select up to three (3) candidates for each commission. This is a new process so it's going to be very interesting to see how it plays out. You can read the agenda for this meeting HERE. That agenda includes a staff report plus attachments which includes submissions by those chosen for interviews and a complete list of all applicants by commission. Take a few minutes to review Attachment #4, HERE, to see who applied. Each applicant has been assigned a time to be present for the interview. The process apparently allows only five (5) minutes for each applicant, regardless of how many positions he or she has applied for. I will be astounded if they are able to hold to that timetable. The council will begin at 4:30 by interviewing ten (10) candidates of the fifteen (15) submitted for the seven (7) seats available on the Senior Commission. Only two of the existing commissioners have re-applied, Gary Parkin and Lee Ramos, and both were selected for interviews. Following the completion of those interviews they will continue to the applicants for the Parks and Recreation Commission, where twelve (12) of the twenty-eight (28) applicants for the five (5) seats available will be screened, again, at five minute intervals. 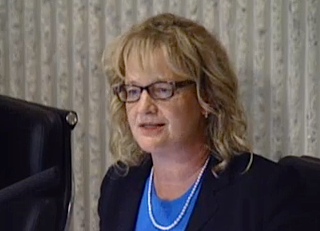 Only Kim Pederson of the recent commission has re-applied and he was chosen for interviews, although Jeff Mathews had previously served on this commission and has applied and was also chosen for an interview. 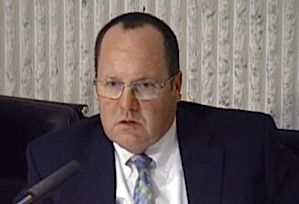 He was most recently Vice Chair of the Planning Commission. 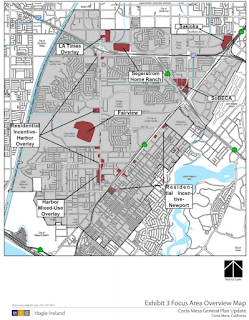 At approximately 6:45 the fifteen (15) candidates of the thirty-six (36) submitted for the five (5) Planning Commission seats will be interviewed. Three of the recent commissioners re-applied - Chair Rob Dickson, Vice Chair Jeff Mathews and Commissioner Stephan Andranian. When this format was originally proposed time was set aside for the following Tuesday, January 31st, for completion of interviews or followup. It's not clear when these seventeen commissioners will be appointed, but the regular meeting of the City Council on February 7, 2017 would be the logical time. I suppose they could appoint them on the 31st, providing time for the Planning Commission to meet on their normal schedule. Perhaps we'll get more guidance on this next Tuesday. I must say, as a guy who made a good living screening applications and interviewing folks, this pool of candidates is outstanding! If you're interested, take a few minutes to read their applications. I think you'll be impressed, too. I hope it will be possible for the City Council to shove partisanship aside for this process and select those who have the best mix of education and experience for each commission. I say that knowing full well that it's probably not possible to remove that element from the process, but one can hope, right? If I was part of this process my preference would be to NOT perpetuate a majority on any of the commissions that had been beholden to the last council majority - but that's just me. There is much work to be done, particularly by the Planning Commission, so there is great value in selecting some candidates with recent experience on that body - particularly since the Development Services Department leadership is made up by consultants, not city employees. We'll see how that goes. THIS PROCESS CRIES OUT FOR MORE TRANSPARENCY! Sadly, because this meeting will be held in the very small venue of Conference Room 1A, audience accommodations are quite limited. And, I'm told, there will be no live television or streaming video of this process and, further limiting transparency of this process, it will NOT be recorded for subsequent viewing. I hope, between now and next Tuesday, wiser heads will prevail and they will move this process to the City Council Chambers, where interested members of the community can gather to watch and also provide live streaming/television of this process. Since they are going to interview candidates one at a time there seems to be no good reason to NOT hold it in council chambers. 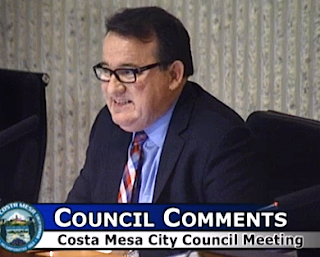 The Costa Mesa City Council met again on Tuesday night for the next installment of this iteration of a new council majority. 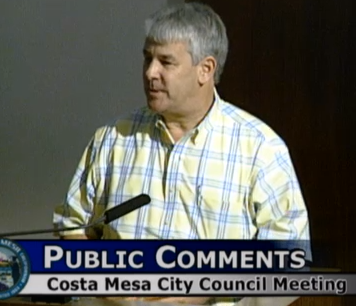 Prior to moving to the Closed Session at 4:00 p.m. two members of the public spoke on one of the issues to be discussed - Yellowstone v. City of Costa Mesa. One member stated that the City should NOT settle that case, and referred to an earlier case with Solid Landings. The other person, Grant McNiff, read a prepared statement in support of Yellowstone. 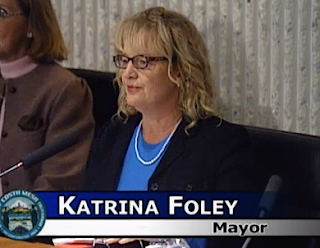 When the open session commenced about 6:15 - a little later than planned, Mayor Katrina Foley announced that Public Hearing item #2 involving a development at 440 Fair Drive has been withdrawn by the applicant. The crowd applauded. 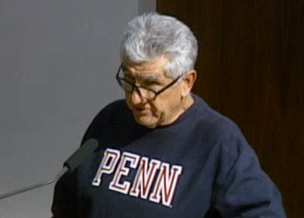 Later, during Public Comments, a College Park resident asked if this was gone for good, to which Foley replied that if the developer intends to propose a new project at that site he would have to start from scratch. Most of the College Park residents present bailed out at that time with smiles on their faces. A few remained to speak to the issue. 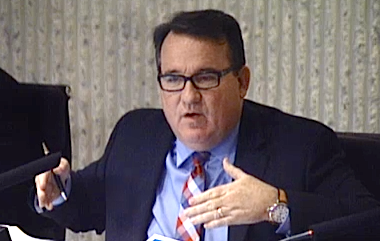 Contract City Attorney Tom Duarte advised that the council had voted, 4-0-1, with Sandra Genis abstaining, to dismiss the suit with Civic Center Barrio. 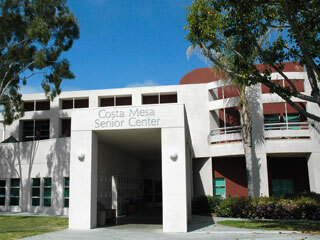 Following the Costa Mesa Minute there was a presentation about the sister city program with Wyndham, Australia. Newport Harbor High School Principal Sean Bolton introduced the program and the Australian participants. 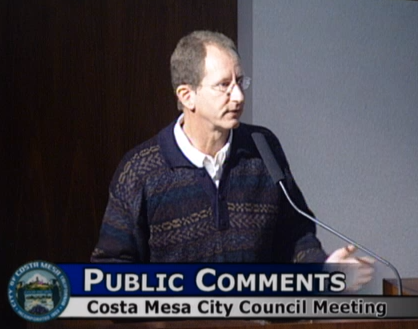 Dan Goldmann addressed his view that the recreation facilities have not kept up with the population increase. He wants to know what the city plans to do to relieve this problem. How are developer Park Fees used? 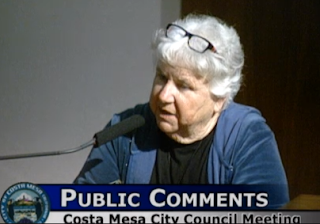 Linda Kean complained about parking on Coolidge and adjacent streets. 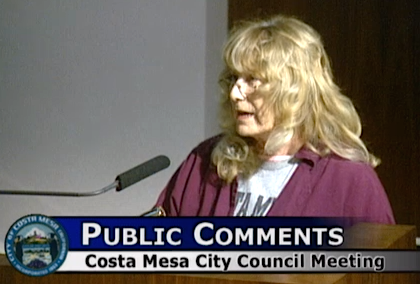 She was concerned about permit parking fees and the impacts on apartment tenants. 440 FAIR DRIVE GONE, PERIOD! Tamar Goldmann asked about the 440 Fair Drive Project withdrawal. Kim Hendricks asked to have Consent Calendar #5 pulled, and thanked the staff for putting up signs to prohibit access to parts of Fairview Park because the burrowing owls are back. 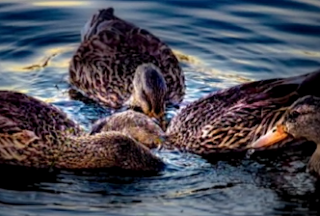 She also addressed sober living rejects in Talbert Nature Reserve and wondered whether it is possible to more tightly regulate their presence into designated areas? Gretchen Fry-Hardy (sp?) expressed concern about the recent developments. She was concerned about rooftop decks replacing open space and adequate parking. An unidentified woman thanked the council for their actions, then showed a slide show about Fairview Park. An unidentified woman referred to an article about the Costa Mesa Sanitary District's survey about adding public toilets throughout the city. She supported it and wondered what the City Council felt about it. She referred to a program in Portland as a successful remedy. An unidentified woman stepped up and observed about the Yellowstone closed session issue, citing her opinion that the City could have won the Solid Landings case and the Yellowstone case is also worth fighting. She, again, cited the bullying by the Sober Living Network. 2028 Fullerton was cited because it's supposed to be a woman-only facility - there are men there all the time. Lee (?) was going to address 440 Fair Drive, but spoke in more general terms. 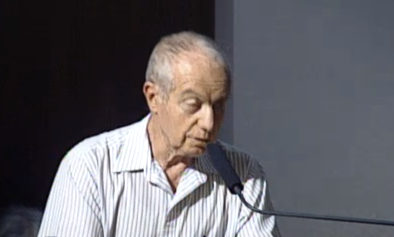 He quoted parts of the General Plan, citing what happened at 440 Fair Drive as a problem. He cited many of the problems with that project. 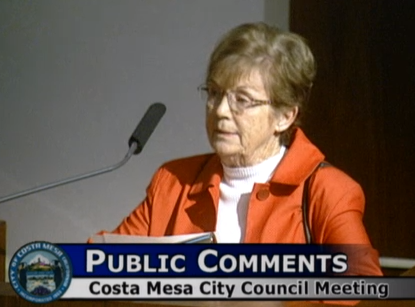 Mary Spadoni thanked the council for revisiting the start times for the meetings. She also asked that the council refund fees residents paid when appealing issues. Denise Davis, a College Park resident, expressed gratitude for the Fairview Park video, then addressed the 440 Fair Drive issue again. She reminded the council that, in 1999, the city was 97.3% built out, yet development continues. She vowed to fight future developments. She wondered about the traffic study that was to be conducted by Raja Sethuraman. 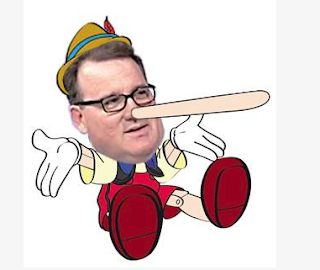 In response to Foley's inquiry, he said they are reviewing the data and will meet with residents. A young woman addressed 440 Fair Drive. She's a 2-year resident. She said, "I enjoy making new friends but I don't like people". 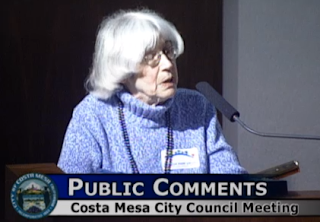 She was concerned about development across the street (Harbor Blvd.) from the proposed 440 Fair Drive project. She said residents should do their homework, pull public records and get involved. 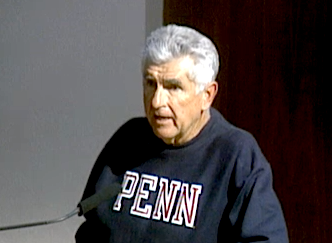 An unidentified man representing his elderly College Park resident mother thanked the developer for pulling the project. 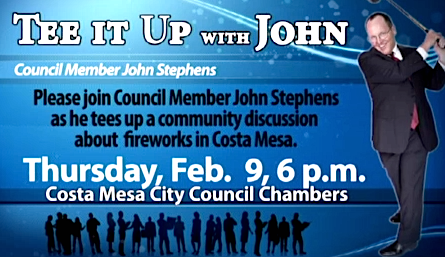 He thanked Councilman John Stephens for meeting for outreach. He thanked the residents for their enthusiasm. He thanked Planning Staff for their hard work on the project. Richard Russell thanked the council. He's concerned that the council arbitrarily fired everyone on all the commissions. He thought it wasn't a very good way to handle it. 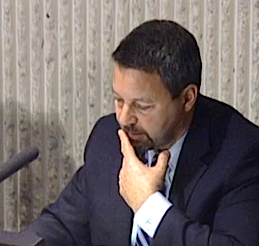 He hoped the council would give the outgoing commissioners a little more pride. 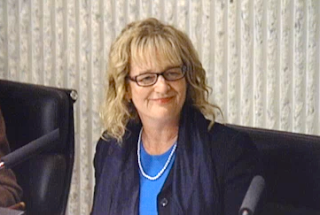 Beth Refakes expressed concern for landscape maintenance at the new terminus of the 55 Freeway. She also asked that the Small Lot Ordinance be reviewed. 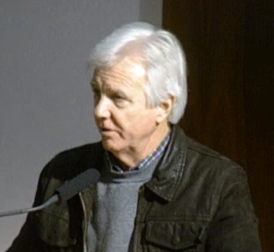 Steve Ray, Executive Director of the Banning Ranch Conservancy, reported on the status of the Banning Ranch development. He reported on the State Supreme Court hearing on the issue. Decision is due around the April 1st. Hopes to stop development of Banning Ranch. Citizen involvement, like 440 Fair Drive, is what makes an impact in this kind of issue. He provided a link to their website: Banningranchconservancy.org. Peter Hill lives on Fair Drive and complained about the traffic speed. Next came Council Member Comments, Reports and Suggestions. 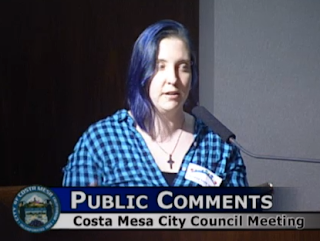 You may recall that the council agreed to limit their comments during this segment to four (4) minutes and trail any other things they wished to speak about to the very end of the meeting. Stephens spoke about attending the memorial service for recently-departed Jeff Arthur, Chair of the Pension Oversight Committee. He mentioned that Councilman Righeimer and former Mayor Steve Mensinger spoke during the service. 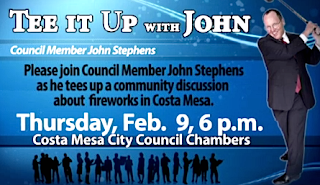 He spoke about Fireworks and indicated he was having a meeting on February 9th in Council Chambers to take public input on the issue. He asked City Manager Tom Hatch to schedule a Study Session to evaluate methods of paying down the Fire Side Fund, on which we pay interest at 7.5%. He suggested perhaps floating a Bond, exchanging debt for debt, but at a lower rate. Regarding Richard Russell's concern about the commissions, he said he hoped previous commissioners would apply, and that he knew some already had done so. The deadline for applying is 5:00 today. 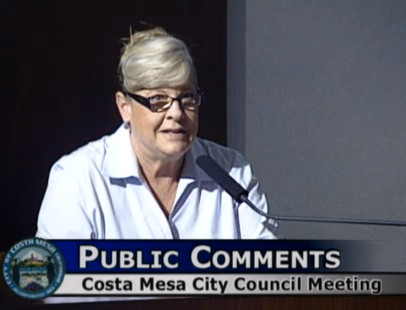 He also asked that the staff look at the possible need for a lighted crosswalk on Placentia at Shalimar. After a brief mention of Jeff Arthur, not unexpectedly, Righeimer used his four minutes to badmouth employee unions and their pensions. He went off on a vitriolic screed in which he, among other things, accused some of his peers of "being elected by the Fire Department." He rejected Stephens' suggestion for a Bond for the Fire Side Fund, stating, "Do not put a mortgage on your house to pay off a credit card!" He went on and on and ended by saying, "I will be against anything that puts the full faith and credit of the City on the hook for pensions for people that don't even live in the city!" Righeimer demonstrated, once again, his deep-seated hatred for public employees and their pensions. Apparently, this is going to be his main focus for the next two years, when he is finally termed-out. This screed was full of lies - he really has a problem with the truth, as we all know - and he fabricated issues later in the meeting, too. If you thought he might be more conciliatory since he no longer controls the votes on the council you were very, very wrong. If anything, he seems to be more strident and vindictive. It's sad to watch his pathetic displays of petulance. Foley reminded the council that they should avoid stating positions on issues when responding to residents questions/comments for fear of disqualifying themselves from future discussions and violating the Brown Act. Righeimer went nuts but failed to turn on his microphone so we couldn't hear his rant. Foley finally had to pound her gavel in an attempt to shut him up. Mansoor almost said nothing, then defended Righeimer's "right" to address issues. 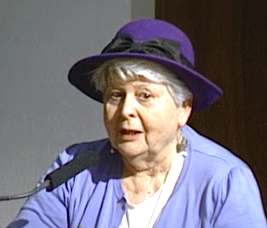 Foley said she intended to adjourn the meeting in honor of Werner Escher, spokesman for South Coast Plaza for decades. 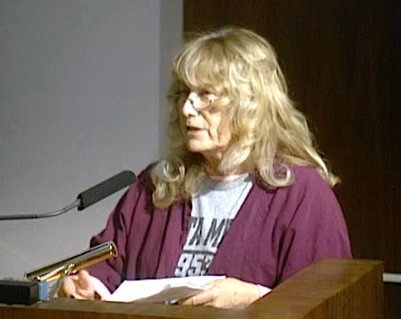 She mentioned the recent dedication of the Argyros Plaza and asked Hatch to investigate the parking issues on Coolidge and the trash/landscape maintenance on the 55 Freeway. She also mentioned the burrowing owl at Fairview Park and wondered about ways to further protect that habitat when they are present. She asked for a Study Session on the Fire Side Fund and also addressed the Commission issue, stating that "we just wanted a change." 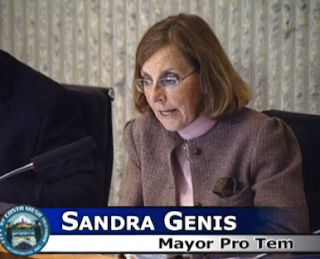 Genis expressed interest in revisiting the Small Lot Ordinance and the Overlays on Harbor and Newport Boulevards. She also asked to have the appeal fee question revisited and wondered about the Master Plan of Parks. Items 5, 6 and 7 were pulled for separate discussion. The council passed the remainder, 5-0. A member of the public pulled item #6, East 19th Street Safe Route To School Project. She said this is not going to help 19th Street. 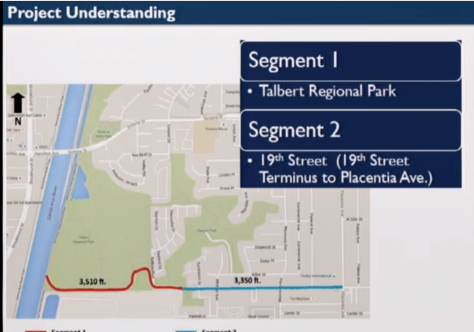 It will result in cut through traffic on Costa Mesa Street and others. She said this is not appropriate for this street. 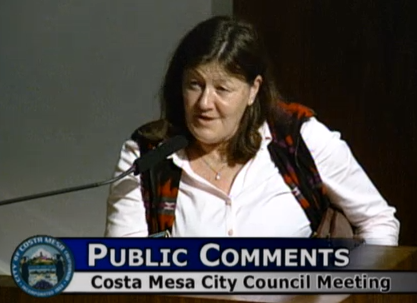 She addressed other problematic recent decisions, like the metal structure planned for Pinkley Park. 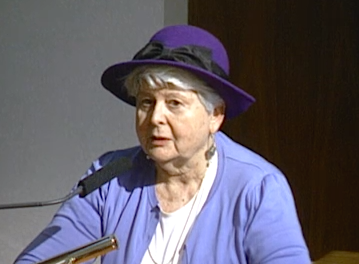 Beth Refakes also spoke to the project. She expressed concerned that it winds up like Broadway, which had a similar project completed. Chokers on Broadway create problems. This will shift traffic to other streets. She encouraged the council to focus on surrounding streets, too. Ralph Taboada, a member of the Bike Committee, spoke on this issue. He expressed concern because 19th Street is a narrow street and was worried about it being a bike route. He wondered about another street that might be more appropriate. Mary Spadoni also expressed concern about this project. "Broadway is a disaster." It would create another street that is not navigable. Eastside doesn't need anymore of these. 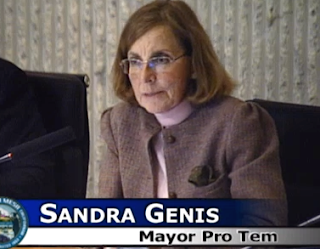 Genis expressed concern about the project and the irony of calling this a Safe Route To Schools project. She wondered about the landscape pallete for this project. She would like to see something done comprehensively - more attention by the Parks and Recreation Commission. 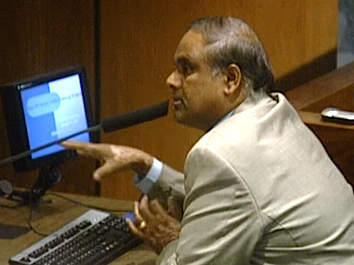 Sethuraman addressed the Broadway project, indicating that it accomplished exactly what they wanted to achieve - slow traffic and cut accidents to zero. Used that plant palatte for 19th Street. He mentioned public meetings. He spoke about the success of the plantings on Broadway, citing a walk with residents recently. 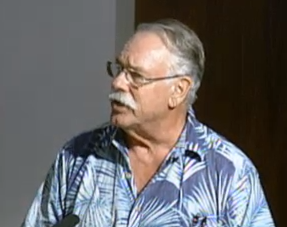 He cited traffic volume - almost 11,000 cars a day at Fullerton. He said the small chokers at the corners will bring the speeds down. Righeimer moved to pass the project. Mansoor seconded it. 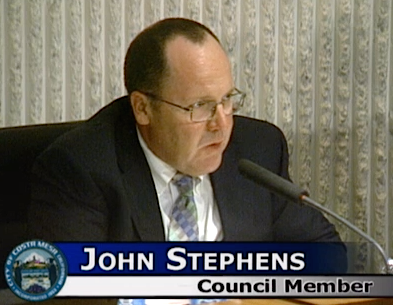 Stephens expressed concern that he didn't have enough project detail and wondered how much time we had to consider this before the grant funding would be lost. Sethuraman didn't have a date on the funding, although he did state that we had a short window. 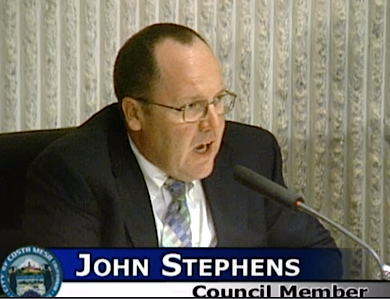 After a long back and forth discussion among councilmembers and Sethuraman Stephens offered a substitute motion, to send this issue back to the Bike and Walkability Committee for their consideration/input. Righeimer again went nuts. When the vote was taken it passed, 3-2, with Righeimer and Mansoor voting NO. It is still unclear as I type this whether there actually is enough time for the Bike Committee to consider this and return it to the council for action without putting the funding in jeopardy. Genis pulled item #7 which was the consolidation of several projects along Bristol Street involving medians, paving, storm drains, signal installation and Delhi Channel diversion. Following a short discussion the councl passed it, 5-0. Public Hearing #1, the 2016 California Residential Code Wind Speed Revision, took less time to hear and vote on than it took me to type this. It passed, 5-0, in less than a minute. 440 FAIR DRIVE - GONE! Public Hearing #2 was the aforementioned 440 Fair Drive project, which had been withdrawn. Old Business #1, the second reading of the change of the CEO and Assistant CEO titles back to City Manager and Assistant City Manager also took less than a minute to hear and vote upon. It passed, 4-1, with Mansoor voting NO. Old Business #2, the West 19th Street Bike Trail Project, was supposed to be a quick item - an amendment to the Professional Services Agreement with Dudek for Environmental Services in the amount of $155,977. It wasn't. It took nearly an hour! Six (6) members of the public spoke on this issue. Eleanor Egan said she's against paving in the park and expressed concern about the heavy truck traffic that will result. 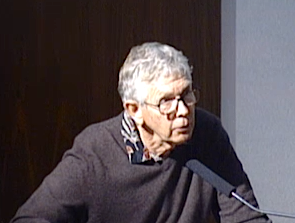 Rick Huffman, a member of the Bike Committee, said his committee has not heard this part of the project and suggested that it be put off until they can study it and report to the council. He also was concerned that other related agencies have not indicated if they are on board with this project, since it is entirely within Talbert Nature Reserve. He wondered why Costa Mesa is the lead agency on it. Cindy Black showed slides of the current condition in Talbert. She cited a probable conflict of interest since Dudek worked for the Newport Banning Ranch outfit that planned to develop that property. 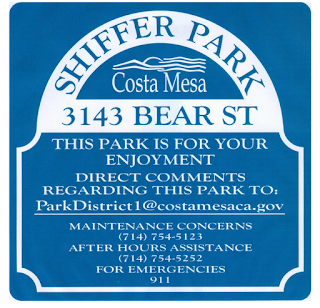 She cited illegal foliage removal along the Banning Ranch fence line. She said there is no public outcry for this project. 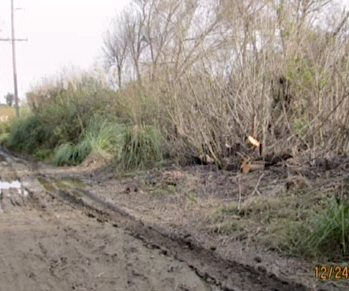 Jay Humphrey cited the value of this native habitat and expressed the opinion that the concrete road planned would do irreparable damage to the park. 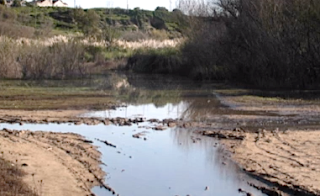 Steve Ray, Executive Director of the Banning Ranch Conservancy, said it's not appropriate for a bike trail because it's a wetlands - and referred to Black's images. He was concerned about disrupting fragile habitat and said we should work with other agencies before spending the money. Ralph Taboada, also a member of the Bike Committee, was concerned about spending the money before other agencies opined on the project. He also was concerned about the endangered species. He suggested this be presented to the Bike Committee for review and report back to the council. RIGHEIMER - "YOU'RE LOOKING LIKE A BUNCH OF KOOKS!" This took about 30 minutes, at which time Righeimer took the floor. He began by saying he was going to be nice - then wasn't. He said to the speakers, "You're looking like a bunch of kooks!" He almost, but not quite, said, "I'm up to here with the goodie two..." It sounded like he meant to derisively say "goodie two shoes", but as sometimes is the case, his alleged brain shorts out and he fails to complete sentences. 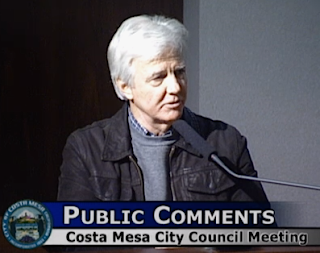 Keep in mind here that he was addressing Egan, a former Planning Commissioner; Huffman and Taboada, appointed members of the City Bikeways and Walkability Committee; Jay Humphrey, former city councilman; Steve Ray, who heads an organization which has successfully (so far) fended off development of the Banning Ranch and environmental activist Cindy Black. These are people who have dedicated large parts of their lives to Costa Mesa. He snarled at Ray from the dais that he lived in Newport Beach and his wetlands became Balboa Island - whatever that was supposed to mean. Once again, we saw the mean-spirited developer in action, snearing and vilifying anyone who disagreed with him and his "pave over everything" attitude. One might have hoped that he would have learned something from this past election, where the voters overwhelmingly rejected his plans to overbuild the city by passing Measure Y by more than 68% and voted to protect Fairview Park from development of any kind by passing Measure AA by an even greater margin - 70.9%. No, he didn't learn a thing. He still blathers on and on - I think he used the word "bloviate" to describe his style at the last council meeting - chiding those who disagree with him. The problem for him now is that he doesn't have the votes. Important decisions will now be made by ALL the council members - much to his chagrin. I suggest that he consider resigning for his own mental well-being. He's done enough damage to the city. 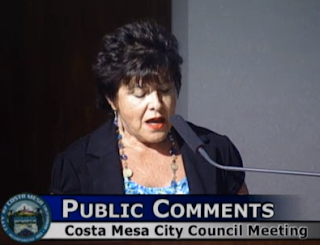 The other councilmembers also spoke. Stephens inquired about the dollars from the representative of Dudek. Genis said she "would like to see something that sits more lightly on the land. ", expressing concern for the concrete roadway that would be wide enough for large trucks. Eventually, almost an hour after beginning this discussion, the council passed it, 5-0. At almost 9:30 p.m. the discussion began on the possible resurrection of the Mobile Recreation Program, which had used a retired SWAT vehicle in the past to provide mobile recreation opportunities throughout the community until budget constraints caused the program to be placed on hiatus. 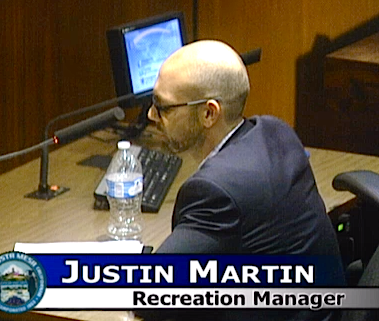 Recreation Manager Justin Martin led this discussion. 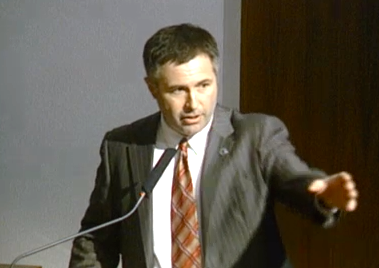 Stephens wondered about the van necessary for this program. The SWAT van is long-gone, apparently. He discussed options with Martin, including the licensing of staff necessary if, for example, a former transport van is used. 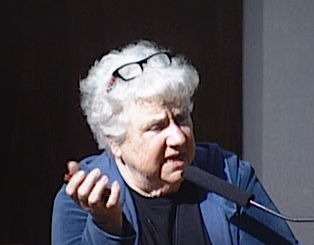 Eleanor Egan reminded us that when this program was put into suspended animation the van, with more than $80,000 worth of improvements, was mothballed. She wondered where it is and why it could not be restored for use. 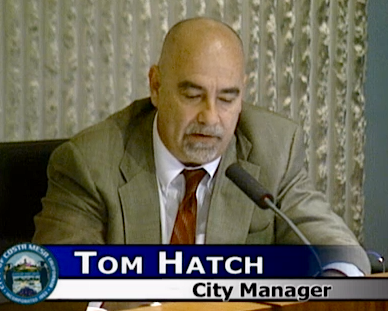 City Manager Tom Hatch, in response to questions, indicated that if the council approves this program, he would bring back funding options, including some sponsorship opportunities. In response to Mansoor's question, Martin indicated the program would be staffed entirely with part-time recreation workers, who would report to full-time staffers. 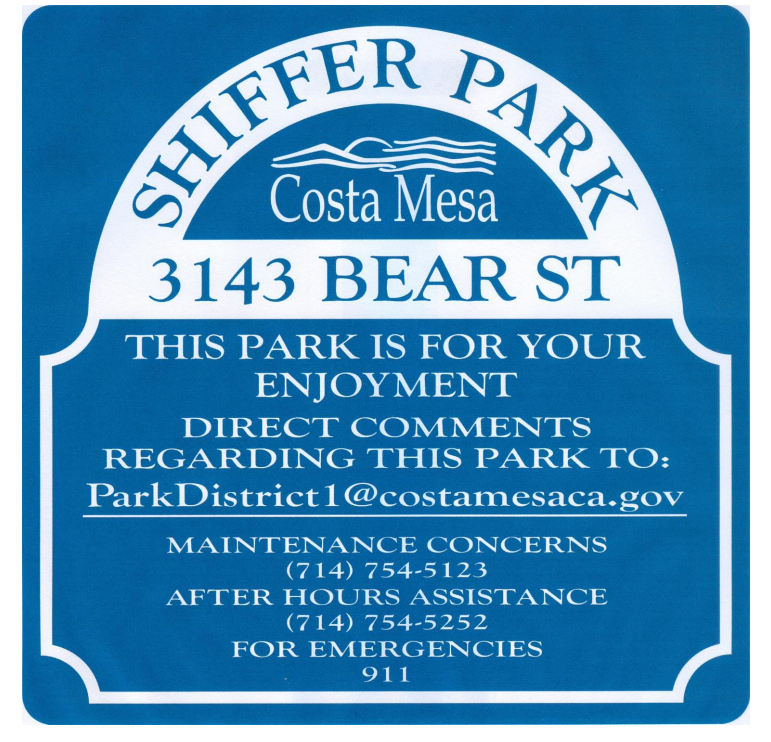 Mansoor also questioned whether this should have priority over, for example, repaving the TeWinkle Park parking lot. Foley opined that this had been a very positive program in the past, serving an underserved segment of our population with great results. Eventually the council voted, 4-1, to proceed. Mansoor voted NO. Keep in mind that this program has served a big chunk of the growing minority community in our city. During his last tour on the council Mansoor was clearly anti-immigrant - he will say anti-illegal immigrant - to the point where he was being accused, with some validity, of being an out-and-out racist. The fact that he didn't support this project didn't surprise me at all - it's consistent with his behavior in the past. It's very sad for us all that we will now have to deal with that baggage for the next four years. Former Mayor Jim Righeimer continues to demonstrate his nasty, vindictive side week after week. He's a petulant, small man, used to having the power to have his own way. Clearly, he has a real problem playing with others. In school you might make him go stand in the corner. His behavior is something we will just have to expect for the next couple years. Please remember when you see him speak that he's truth-challenged - a man declared by a court decision to be a liar. You'll become more and more aware of that trait as you fact-check his comments. It's quite sad for our city. 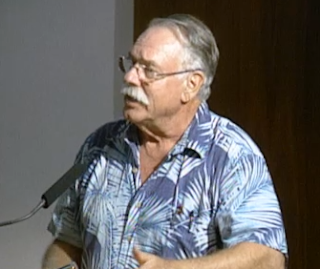 At 9:40 Foley adjourned the meeting in memory of Werner Escher. The next meeting will be a special meeting on January 24th at which candidates for various commission openings will be vetted. Remember, the deadline for applying for a position on the Planning, Parks and Recreation and Senior Commissions is at 5:00 p.m. today! You can do it online, so get with it!